Since the Soviet Luna 24 mission in 1976, no other soft landing was performed on the moon until very recently, in 2013. Two years ago, China landed with great pride its first lunar probe: the Yutu rover, part of the Chang’e-3. Now, Chinese researchers who have analyzed samples drilled by the rover say they’ve discovered a new type of lunar rock unlike anything the Americans or Soviets had brought home before. The rover performed its sampling work in an impact crater in the Mare Imbrium, right next to a comparatively young lava flow. The Earth’s Moon has no large volcanoes like Hawaii or Mount St. Helens. However, vast plains of basaltic lavas cover much of the lunar surface. The earliest astronomers thought, wrongly, that these plains were seas of lunar water. Thus, they were called ” mare ” (pronounced “mahr-ay”), which means “sea” in Latin. But while we still have active vulcanism here on Earth, the last time lava flowed on the moon was 3 to 4 billion years ago. The leading moon formation theory says that a Mars-sized planet called Theia collided laterally with the our early planet, which looked nothing like today. The collision released immense amounts of energy and debris, and over millions of years part of this debris accreted and cooled to form the moon. Radioactive elements heated up the rock beneath the crust, however, and 500 million after the moon formed volcanic lava slurped into impact craters. These formed the mare. 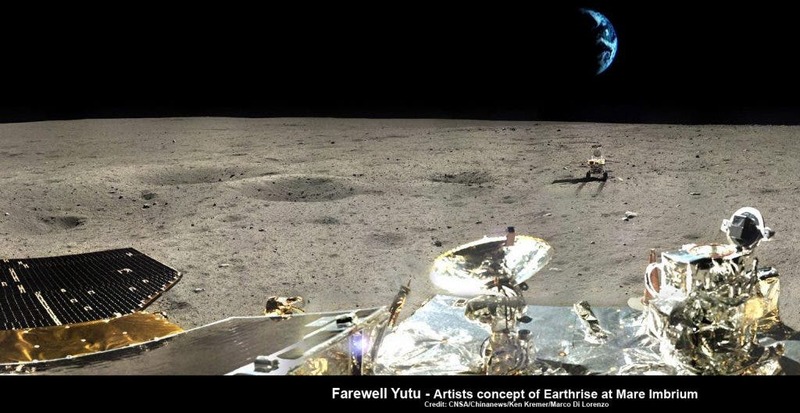 The Yutu rover probably examined rocks and minerals from 3 billion year old lava. While Soviet and American missions gathered basalt rocks either high or low in titanium, the basalt rocks sampled by Yutu are intermediate in titanium content and rich in iron oxide. “The diversity tells us that the Moon’s upper mantle is much less uniform in composition than Earth’s. And correlating chemistry with age, we can see how the moon’s volcanism changed over time,” said Bradley Joliff of the Washington University of St Louis, the only American partner in the Chinese team.